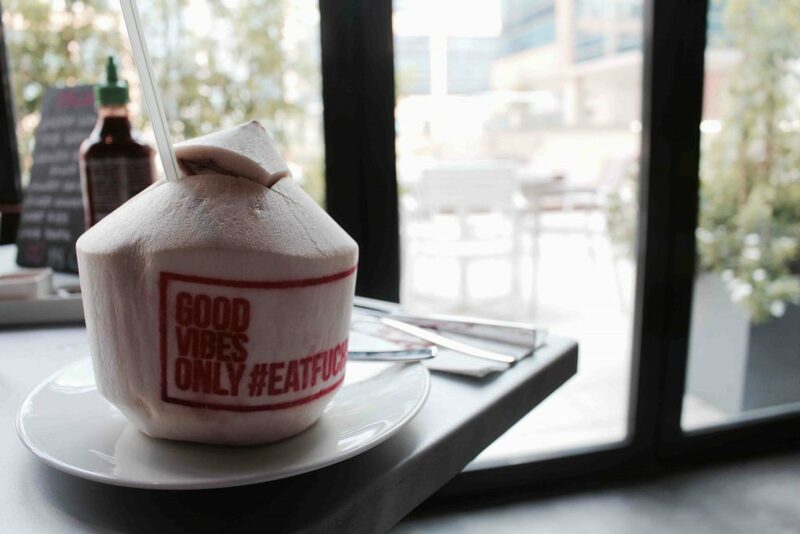 Hello eveyone, so we are finally back in Dubai and back to discovering some amazing eateries for you guys! Todays review is on our most favorite cuisine ever, Thai food! Being ardent fans of this cuisine, finding authentic Thai food true to its flavors, is a task. 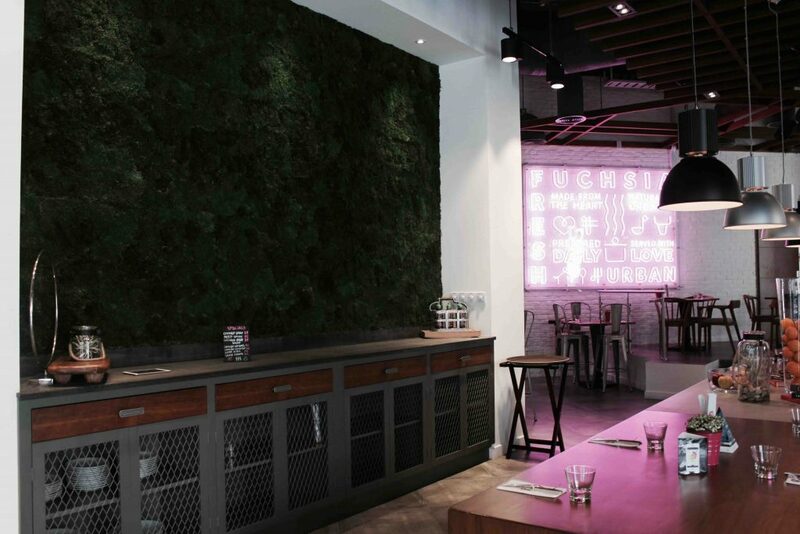 Last week we were invited to try out Thai food at Fuchsia. 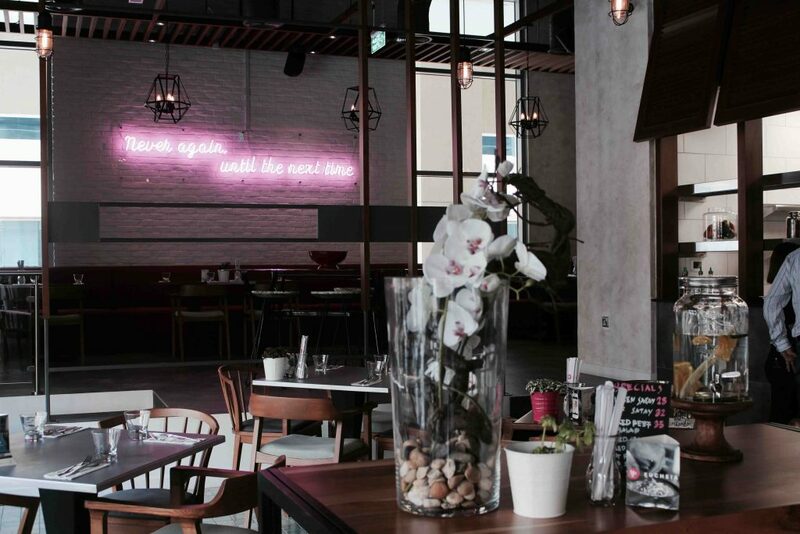 After the Barsha Heights branch being a huge success, Fuchsia decided to open its new branch in Bay square and we were really excited to try this out! 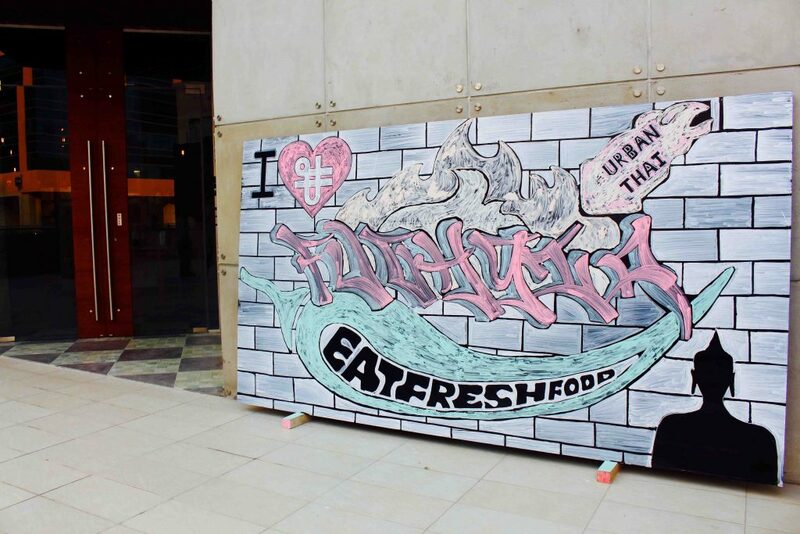 When we arrived at the restaurant a colorful funky street art welcomed us into the cozy little space! Upon entering you cant help but notice the cute little neon sayings and quotes all around the place, we absolutely loved the ambience of this space! 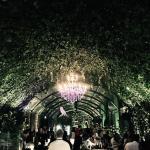 The place was very vibrant and inviting, moreover the attention to detail was commendable. Upon choosing our seats, we were welcomed with fresh tender coconut water from Thailand. I can’t stress enough how amazing the Thailand coconut water (AED 25) tastes and is such a healthy and refreshing alternative to sodas! P.s how cute is the Good vibes only stamp on these coconut shells, love the attention to detail here. 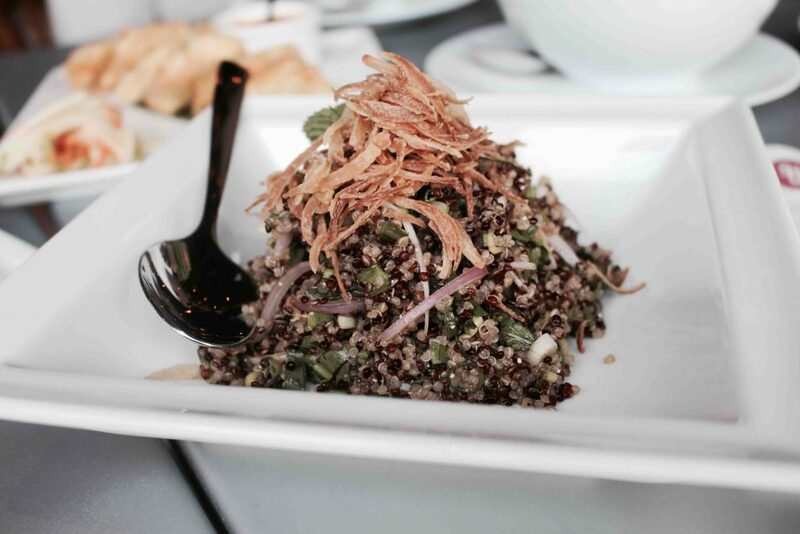 For salads we decided to try out the Papaya salad (AED 23) and the Quinoa salad (AED 26). We decided to go for the one without the prawns as we dint want to go to heavy on the salad and really wanted to keep some room for the rest of the course. 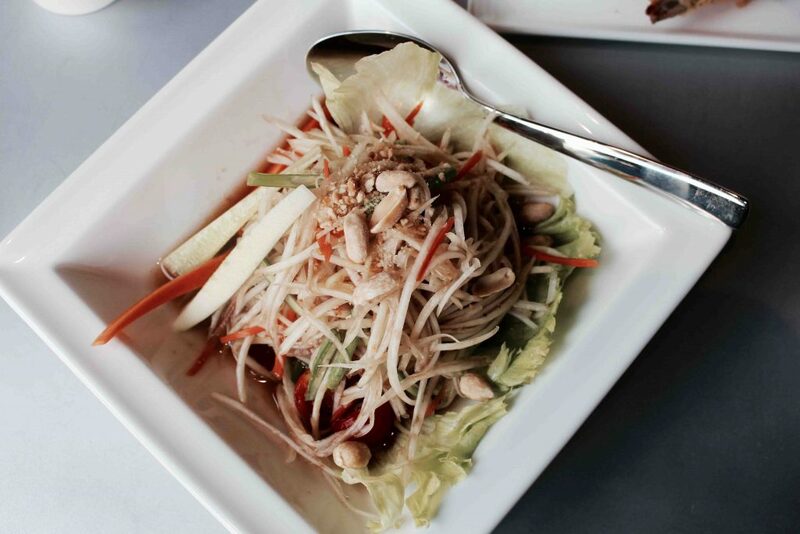 The papaya salad consisted of shredded green papayas, carrot julienne tossed in chili lime dressing and ground peanuts! We absolutely loved it and this was a great way to start out our meal. The quinoa salad on the other hand was super light and a healthy option. We dint think it was the best we have tried, it was a tad bit on the sweeter side and we felt the sweetness was kind of too overpowering. Next we decided to try out their soups, we decided to order a veg and a non-veg option for the soups. For the Veg option we went for the Spicy coconut soup (AED 27) with vegetables instead of chicken. For the non-veg option we decided to go for the Tom Yum soup with Prawns (AED 29). 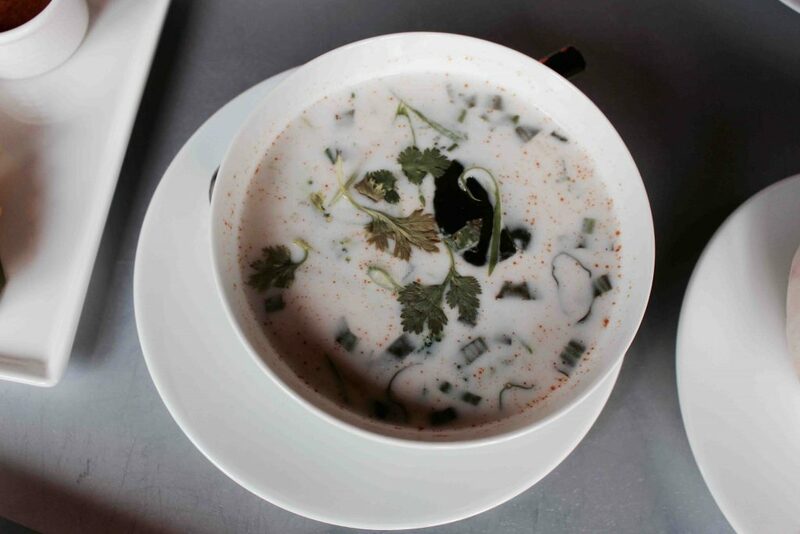 The spicy coconut soup was one of the best we have tried in a long time! The rich coconut milk with a hint of spice and sweetness was well balanced and we couldn’t get enough of this one, this one should definitely be a must try for all the vegetarian lovers out there! You know a Thai restaurant is authentic when it passes the tom yum test. And Fuchsia passed this test with flying colors. 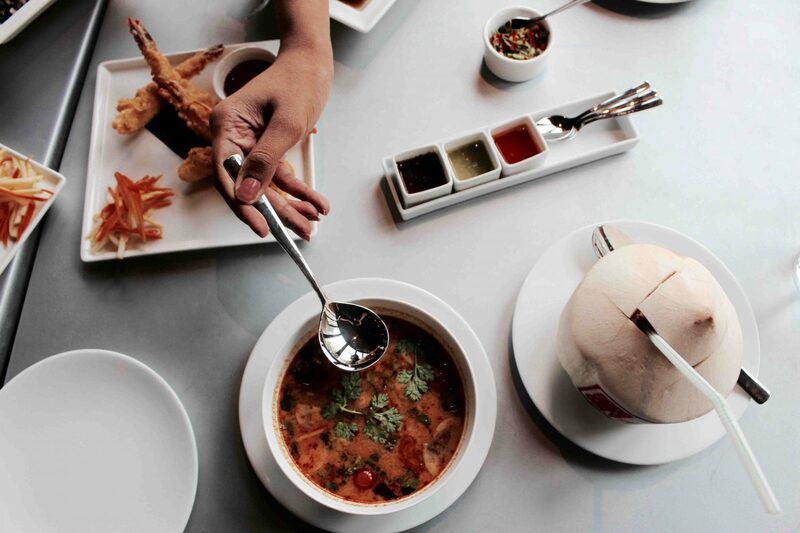 The soup was seasoned with exotic thai herbs, mushrooms and lemon grass that all merge to create a healthy and soothing broth that will light up your taste buds. 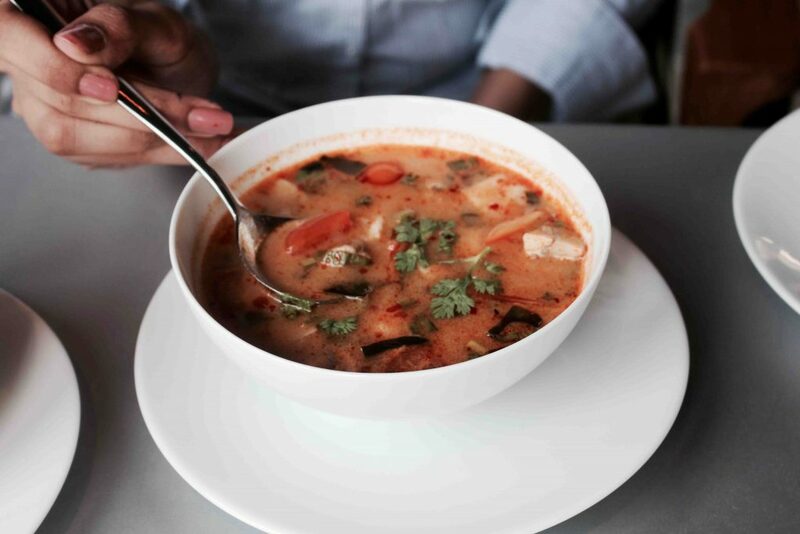 It’s safe to say that the Tom Yum soup here is probably one of the best we’ve ever tried. 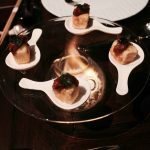 We also went for the traditional Prawn tempura (AED 31) and the Golden-fired tofu (AED 22). 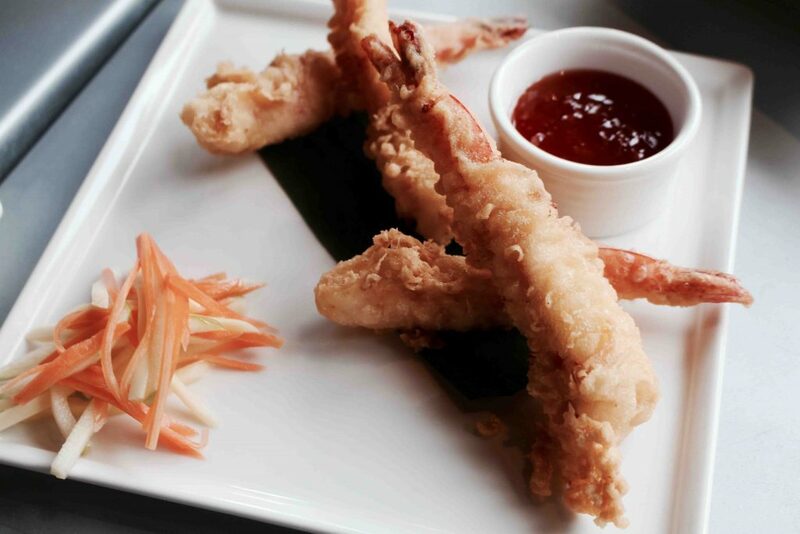 The prawn tempura was served with a sweet and chilli sauce that made for a perfect dip with the beautifully done prawns. Special mention to the chef for putting out one of the best tofu dishes we’ve tried and ended up liking. 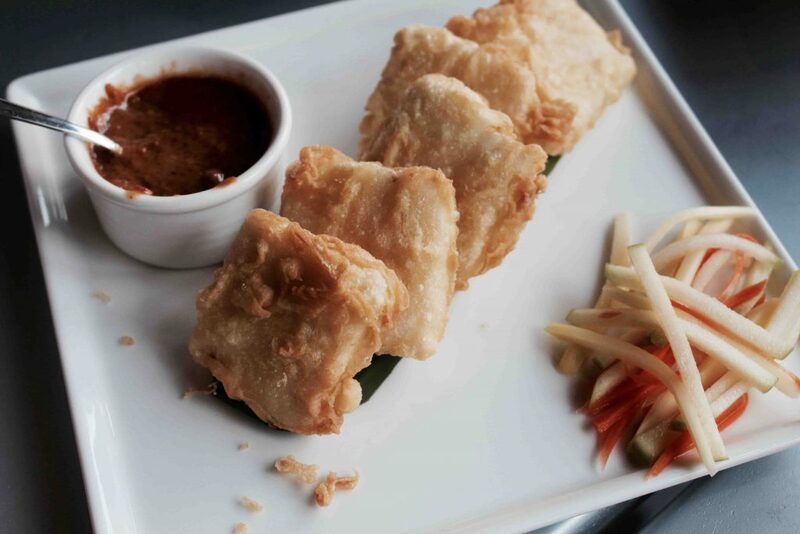 Tofu is one thing that is not just difficult to like but is also very tedious to cook and the fried tofu here served with the most lip-smacking, spicy peanut sauce is beyond amazing!! 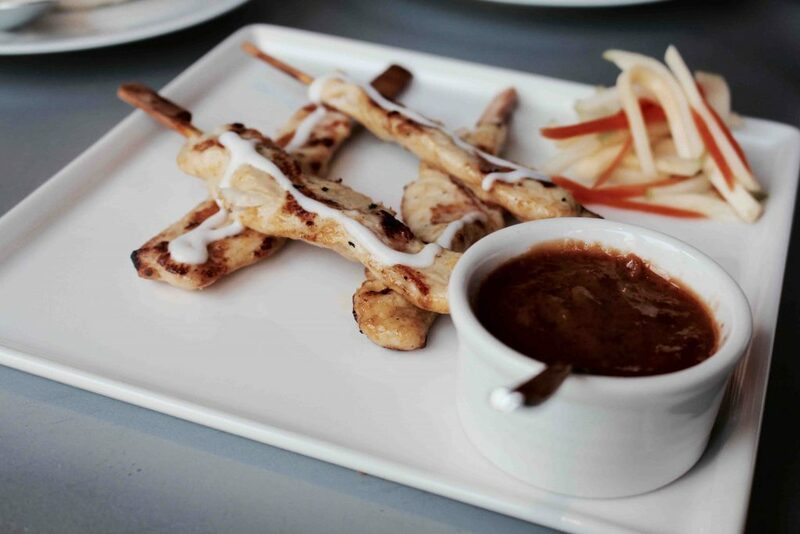 We were almost done with our starters when our server recommended we try something from their specials menu so we chose to order the Chicken Satay(AED 25). Honestly, I’m always a little paranoid about chicken skewers as most places tend to serve these quiet dry and bland but these Satay skewers were marinated to perfection and the chicken was so tender and succulent. Highly recommend trying these out! For main course we decided to go for their most famous Pad Thai (AED 32), after talking to the servers we discovered it’s their most ordered dish, and we cannot quite contemplate why not! 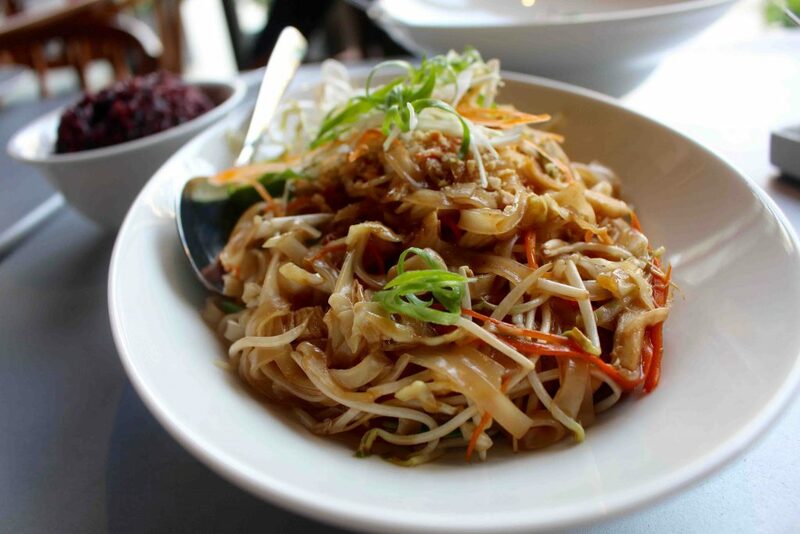 Pad Thai is a blend of stir-fried rice noodles with bean sprouts, garlic and ground peanuts. It comes with a option of adding vegetables, prawns or chicken according to your preference. We went for the chicken option this time around. You know you have these dishes in a restaurant, which become your favorite and have you craving for more? This has got to be one of them!! The flavors were bang on perfect! They tasted just like the ones we have tried in Thailand right the Wok, fresh and flavorsome to a whole other level. No Thai meal is complete without savoring upon their delicious curry! We love our curry and its something we often try mastering at home ourselves. We decided to go for the Thai Green curry with vegetables (AED 36) and a side of fresh jasmine rice (AED 7). 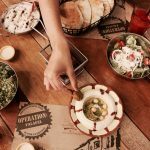 The server also suggested us to try out their special steamed wild rice (AED 9), which is a blend of brown rice and red wild rice. 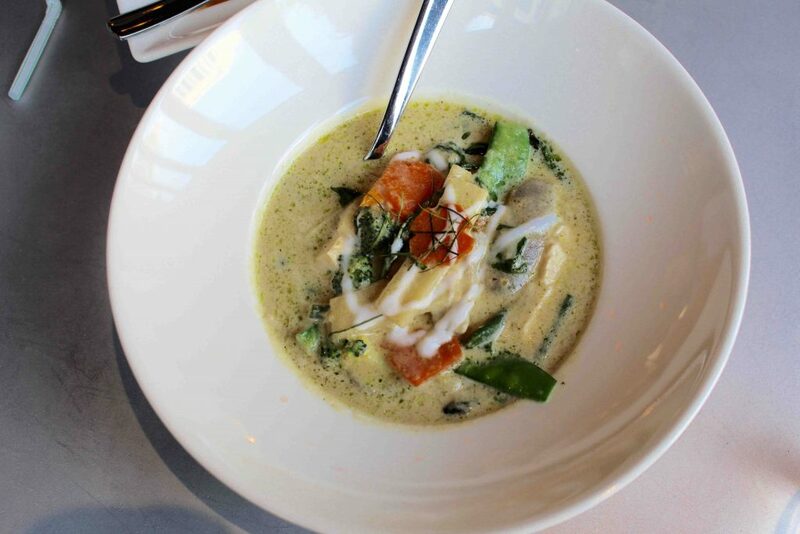 The Thai green curry was a delight to have, we loved how it was so different from other Thai restaurants, here the curry was almost like a rich broth with an array of flavors spicy, aromatic, sweet and savory at the same time! Also, we couldn’t get over the special blend of brown and red wild rice. These were one of their healthier options whilst being so darn delicious! Lastly, we ordered one of their specials, grilled Salmon served with red curry (AED 38). At first, this sounded a little unusual to us since we’ve mostly had Thai green and red curries with chicken or just vegetables. The dish serves a striking red curry with all the right Thai flavors and the soup/ broth like consistency of the curry complimented the perfectly done salmon dreamily. Time for ending our scrumptious meal on a sweet note, by this time we had no room whatsoever to try the desserts. 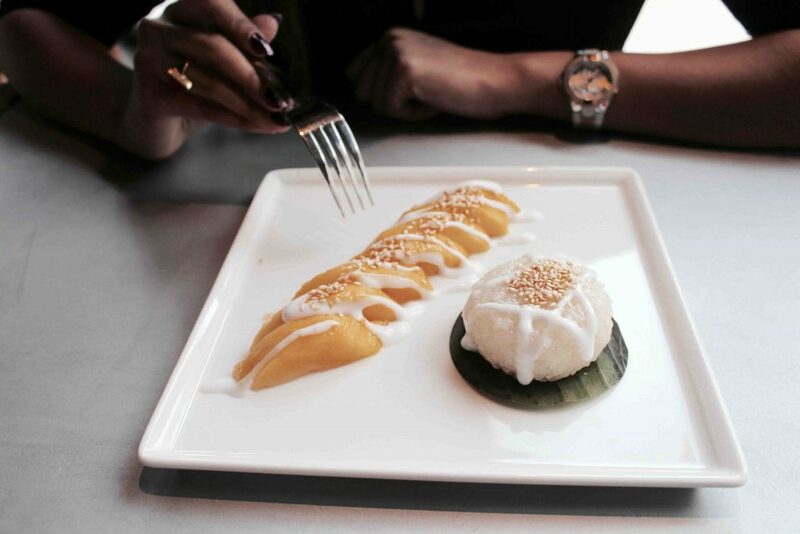 But we couldn’t leave without trying out this Thai favorite dessert, the Mango sticky rice (AED 25). For those who haven’t tried this popular Thai dessert, it’s a beautiful blend of fresh ripe Thai mango slices with sticky rice infused with coconut milk. The combination works and blends so beautifully with each other. The mango sticky rice was made to perfection and melted with every bite. To conclude, the staff was helpful and super friendly in helping us choose our meals and made sure we did not miss out the best. There are tones of healthy options available for those health conscious people, which is amazing! Not only did the food meet all our expectations, its also great value for money. 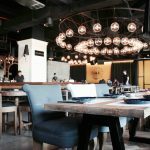 Fuchsia is an ideal place for all Thai food lovers and even if you are not a Thai food fan you are going to fall in love with the food once you try it. For reservations and bookings contact +97144535403.